Impeccable build quality, innovative features, and outstanding performance make the Scout 195 Sportfish a top fishing boat choice. 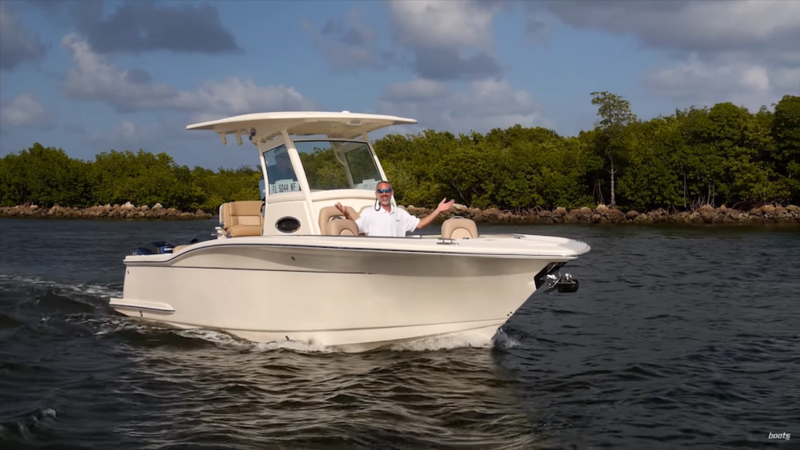 If you’re a boat builder whose lineup focuses heavily on fishing, you know that the 18- to 20-foot center-console market is about as competitive it gets. But if you’re Scout Boats, you know exactly how to outshine your competition: by providing impeccable build quality, innovative features, and impressive performance. It’s this delta of merits that have given Scout one of the best reputations in the fishing boat niche. And the Scout 195 Sportfish continues this tradition. 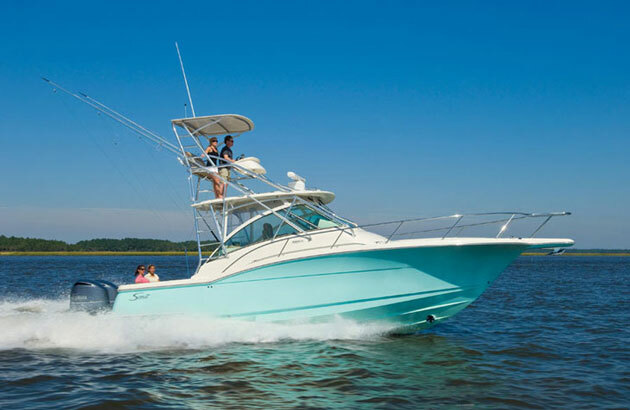 Smart and elegant looks, thoughtful fishing features, and impressive performance are what every Scout boat, including the 195 Sportfish, is about. My test ride on the Scout 195 Sportfish came during the Miami International Boat Show, and as an extra treat it was fitted with Yamaha’s brand-new (and extremely smooth and quiet) F115 outboard. This also happens to be the standard power setup for this model. A Yamaha F150 or a Mercury 115 are optional. If you want to blast along at upwards of 50 mph, that F150 is going to be your ticket, but those horses do come at the price of fuel economy and weight. I like the F115 for its intelligent combination of weight, speed, fuel economy, quietness, and performance—you’ll burn just 3.5 gph at a 20.2-mph cruise and top out at 41.2 mph with this engine. Have a look at the lines of the Scout 195 and you’ll begin to notice some very typical Scout DNA. The sheer line is flat aft, then rises forward dramatically. 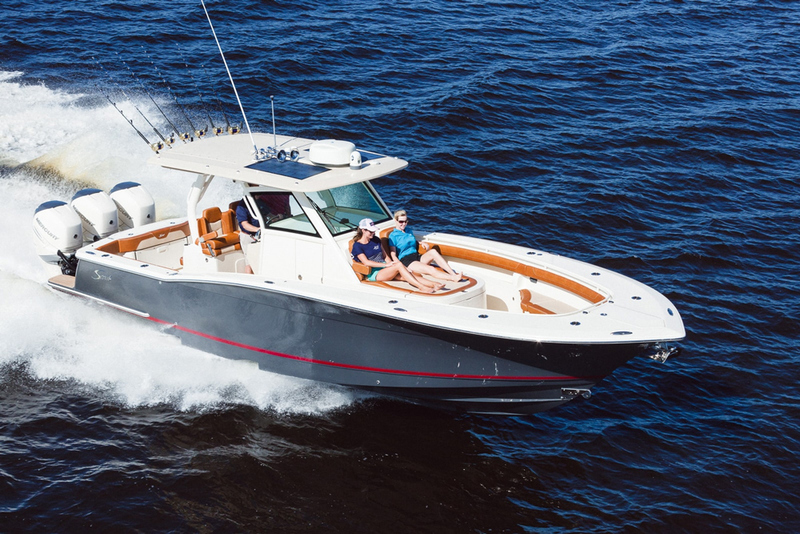 The forward end of the Scout 195 has a “Carolina” look with significant bow flare and a wide, flat deck cap, all with the intent of keeping occupants dry in a chop. The hull is designed for work in choppy water with a graceful but sharp entry and Scout’s NuV3 hull scheme. The NuV3 design is comprised of variable deadrise angles to provide enhanced fuel efficiency and performance. 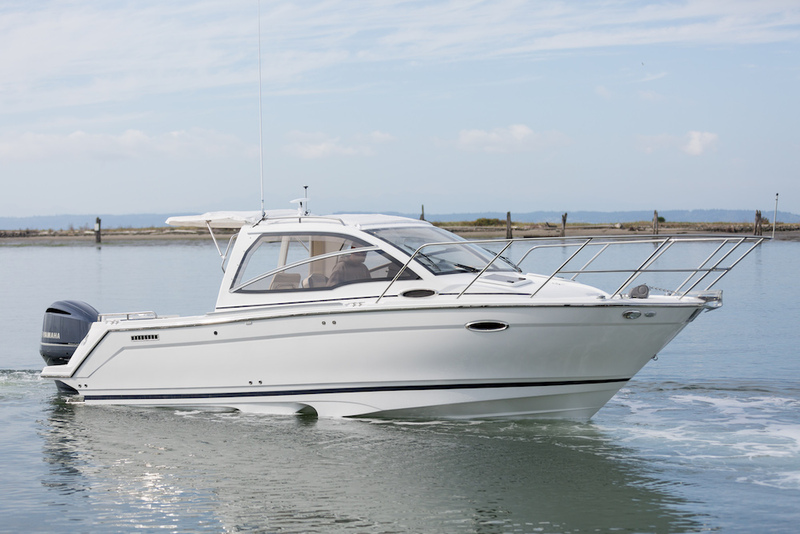 The whole package is clean and smart looking, with an elegance that eludes many center-console boats in this size range. There's plenty of comfy seating (or casting space) back aft on the Scout 195 Sportfish. Like all Scout boats, the 195 Sportfish is 100 percent composite, meaning no wood is used anywhere in its construction… not a splinter of it. Another point of pride for Scout is its reverse shoebox hull to deck joints. Conventional hull to deck joints go together much like when you put a lid on a shoebox. The lid (deck) is laid down onto the hull (box), and then the two are bonded together at the flange where they meet with strong adhesives and mechanical fasteners. Scout’s hull-to deck joint utilizes a large flange on the hull instead of the deck, and the two are married together using thickened, high-strength resins. It’s not only strong, but watertight, too. As far as fishing features go, I really like the lack of rails and other fishing line-tangling hardware on deck. 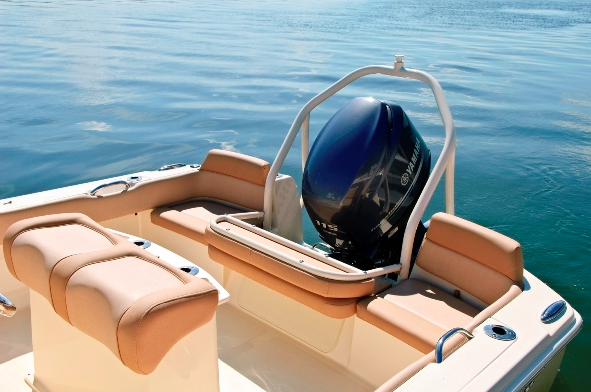 An aerated, integrated livewell in the center-console leaning post is a nice included feature, as is a 72-quart removable cooler (situated forward of the center-console, serving double-duty as a cushioned seat). There are also plenty of places to cast a line from, with two aft casting decks (which can be used as jump seats) and an expansive forward casting platform. That casting platform is nice, but it also sits pretty high up off the water, and that bothers some light-tackle and fly anglers. To be fair, though, this isn’t a bay boat, nor does it pretend to be. And of course there’s plenty of rod stowage (four flush mount deck rod holders, four console rode holders, two leaning post holders, and room for more rods under each gunwale). 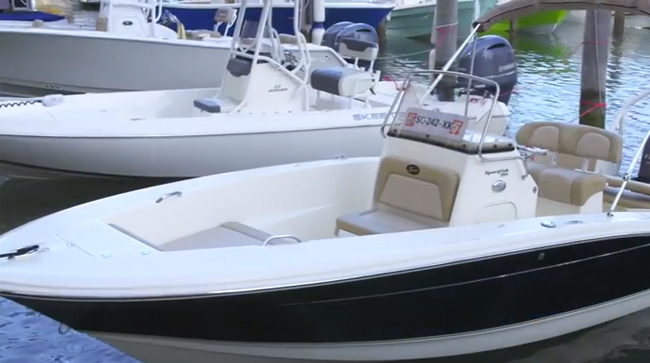 The Scout Sportfish 195 feels open and roomy. Check out the high gunwales; they give an extra feeling of security in the choppy stuff. 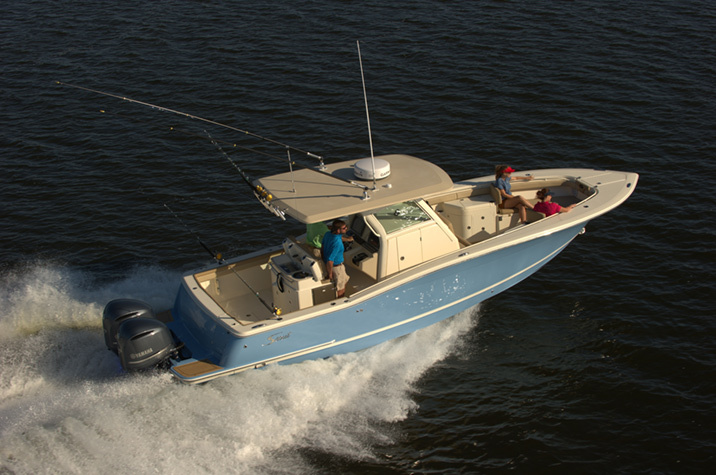 Fishing features aside, the layout of the Scout 195 feels open and never crowded. High gunwales and a wide deck cap give a secure feeling, while a combination of standard and optional cushion choices can be configured around the deck and cockpit to provide comfort for less fishy operations, such as a sundowner cruise or a hop around the inlet with family and friends. There’s a ton of stowage up forward under the casting platform, and also under the center console for items such as PFDs, crew gear, and safety equipment. Despite the lack of railing, Scout has been thoughtful enough to place stainless handrails both fore and aft, as well as on the center-console. Oh, and kudos to Scout for including midship cleats in addition to the ones on the stern and bow; that's something every builder should include. Power Single Yamaha F115 four-stroke outboard, swinging a 13.25" x 16" three-bladed stainless-steel prop. Now for some things you won’t find on the Scout 195. 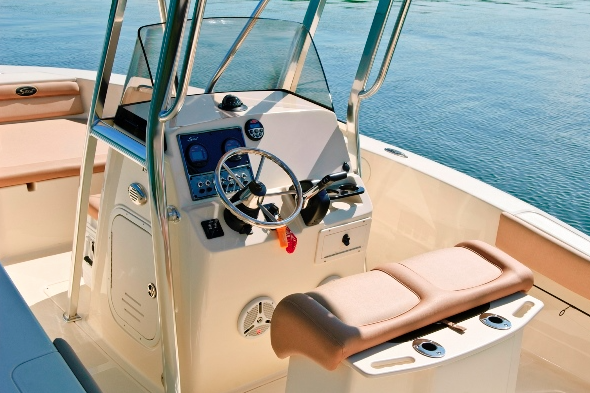 First, there are no under-console head/porta-potty accommodations, which are becoming almost commonplace on center-console boats of this size. And while this doesn’t bother me personally, some of my boating friends simply wouldn’t consider a boat without it (think along the lines of keeping spouses content during a long day on the water). Another thing you might miss are cockpit fish lockers—the Scout 195 has only a cooler. And that’s sort of a shame considering some folks will likely use this boat for some larger, near-shore species such as dorado, and kingfish. That said, there are definitely more things that the Scout 195 Sportfish has, than it doesn’t. Whether you’re trying to find ultimate build quality and thoughtful features or the best in fishing features and performance - or all of the above - the Scout 195 is a great place to look. 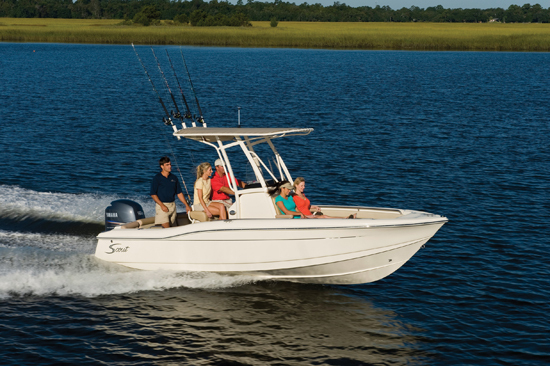 Other Choices: If you’re looking at center-console boats in this range, also give the similarly sized Aegis 18CC, Cobia 201CC, or Carolina Skiff Sea Chaser 21 LX Bay Runner a look. Some larger choices include the Pro-Line 23 Sport or the Pathfinder 2200. 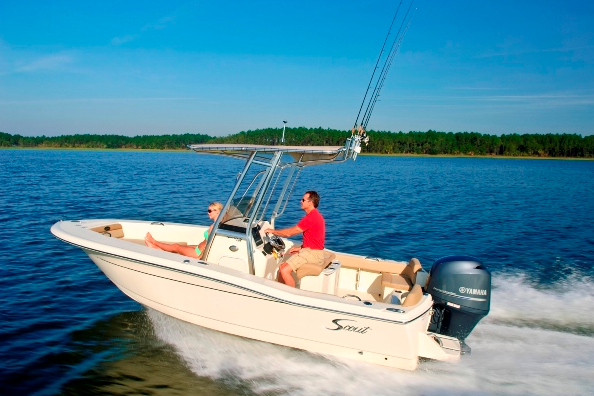 Check out these listings for Scout 195 Sportfish boats.